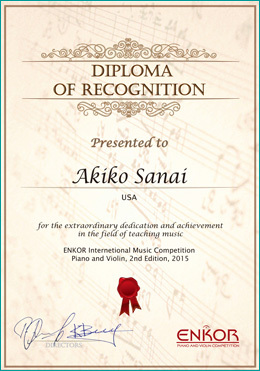 Born and raised in Japan, Akiko Sanai began learning and playing the piano from the age of 6. She has studied piano performance with Paul Lyddon, a retired University of Hawaii Music Department Professor. She is a board member of Honolulu Piano Teachers Association and an active member of the Music Teachers National Association. 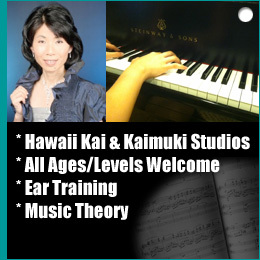 Akiko began teaching piano in 2004 and has shared her knowledge of music for the past 11 years. 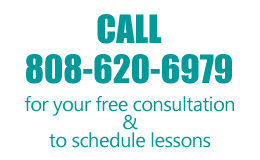 Akiko teaches from two studios conveniently located in Honolulu, one in Kaimuki and the other in Hawaii Kai. Each studio is equipped with a Grand Piano. Akiko's love of the piano has compelled her to invest in world renown pianos; her studios contain a Steinway, a Bosendorfer and a Samick Grand Piano. Akiko admits that it's a bit unusual for students to learn on the such expensive Grand Pianos but adds that the students enjoy them very much. 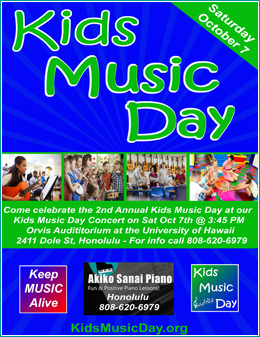 Akiko performs throughout Honolulu and at her students recitals. She often collaborates with other musicians who play traditional Japanese instruments such as Koto, Shamisen or Shakuhachi. In addition to the piano, Akiko plays the traditional Japanese flute “Ryuteki” and is a Gagaku Society of Hawaii member. Her students are encouraged to perform at recitals twice a year. Some of her students go on to perform at the state competition. Students are also encouraged to take the exam provided by Royal Conservatory Music Development Program. # Hayden's performance after taking lessons for 5 month. 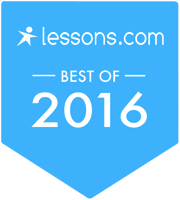 * Piano Teacher in Honolulu, Hawaii... Akiko Sanai Piano Lesson Studio.